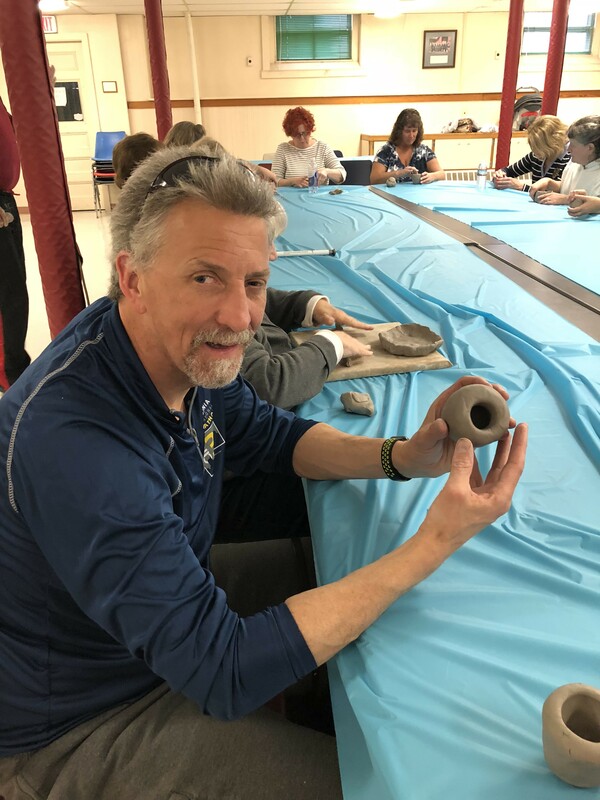 The Lighter Side: Randy tries his hand at crafting pottery! Randy tries his hand at a pottery workshop for the sight-impaired, held by Future In Sight. Future in Sight has been promoting an assortment of activities intended to enrich the lives of the clients they serve. One opportunity caught my attention as something I had always wished to try. I almost let the opportunity slide past which would have been regrettable on many levels. Fortunately a second nudge exposed me to a wonderful afternoon experience and one which inspires me to plan a visit with friends for a follow up crafting session. More than 20 sight-impaired adults arrived bristling with eager anticipation to Future In Sight to meet with our guide, Ahmad Qadri. 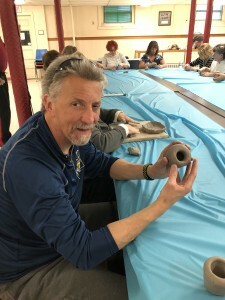 He had provided an incredibly successful youth experience previously and his blend of history, crafting, teaching and experience soon had us transforming our egg of clay into an assortment of different cups and bowls. It was no small chore to work with so many; his patient and encouraging manner kept us all working forward with insight into his passionate approach to pottery. We had the chance to feel the broad assortment of tools and to apply several of them to the shaping and decoration of our devices in our all too brief time together. Although we didn’t fire our craftings into a permanent keepsake, he did offer to have this done at his studio: Rainmaker Pottery. Randy and the group in attendance work on the pottery wheel. He did, however, provide us the fantastic opportunity to work on an actual pottery wheel. At the speed of the wheel’s turning, our clay would change so much more dramatically with the most subtle of pressures from a thumb, finger or tool. 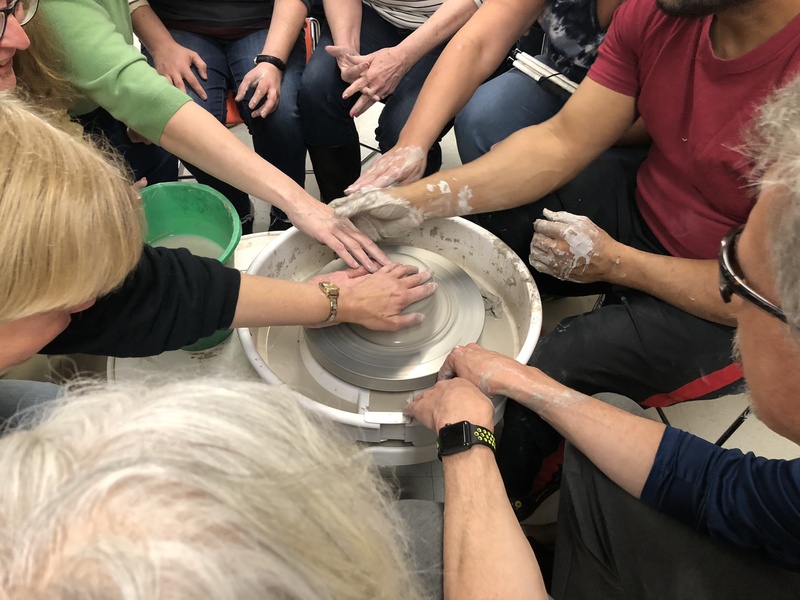 We didn’t all have time to craft on the wheel in this introductory lesson but we could place our hands upon the bowl and feel the transformation as he described the subtle move he planned. It is so easy to shape our pottery and so easy to shape our lives a little better with the right guidance! My takeaway involved the excellent reminder to choose involvement and participation as often as possible. As someone working to support and promote the excellent work (and needs) of Future In Sight, I had almost forgotten to appreciate the value they can provide to my life as a person who is blind, still learning and exploring opportunity in our world. Thank you to Future in Sight, Rainmaker Pottery, and Ahmad Qadri specifically. 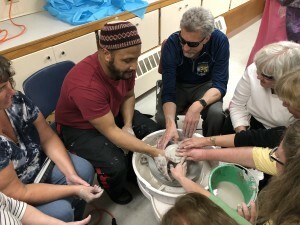 Attendees of the class work on a pottery wheel together.